Daisy Gilardini is an award-winning conservation photographer who first fell in love with the polar regions on a trip to Antarctica in 1997. Since then, she has spent most of her life photographing the farthest reaches of our planet, participating in more than 60 expeditions to Antarctica and the Arctic. Her passion for the natural world has grown into a lifelong commitment to sharing conservation messages with the public. She is a member of the International League of Conservation Photographers (iLCP), a fellow of the prestigious Explorers Club, and a member of the Swiss Nikon Ambassador team. Gilardini's images were recently awarded the 2017 Conservation Story Award and the 2016 Grand Prize by Nature’s Best Photography Windland Smith Rice International Awards, and her image of a bear patiently waiting for the sea ice to form in Hudson Bay (above) earned her the cover of Can Geo's Best Wildlife Photography 2018. Here, the British Columbia-based photographer discusses polar bears in Wapusk National Park and shares a few of her images. For nearly 20 years in late fall and early spring, I pack up my photo equipment and make the trek from British Columbia, where I now live, to Wapusk National Park [Editor's note: Wapusk is Cree for "white bear”] on the shores of Hudson Bay in northern Manitoba. These two seasons are extremely different in this subarctic region mixing boreal forest and tundra, but both offer amazing photo opportunities. In the fall, a population of approximately 1,000 polar bears emerge from the land where they’ve spent their summer practically starving, and gather around the shoreline to wait for the sea ice to form in Hudson Bay so they can gorge on seals. Hudson Bay’s geography is such that it is actually one of the first areas in the North to freeze, and the bears begin to wait around its shore starting in October. This was the case for the bear in the cover image. When I spotted it, it was lying near the shore in November, patiently waiting for the ice. 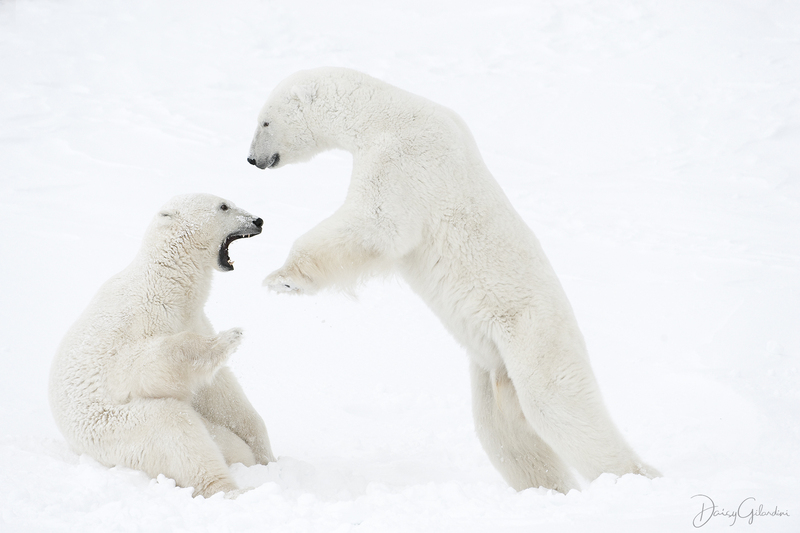 This population of polar bears is usually solitary in the summer, but when the bears congregate in the late fall, it’s common to see sparring, or play-fighting, between young males — a spectacular behaviour to photograph. 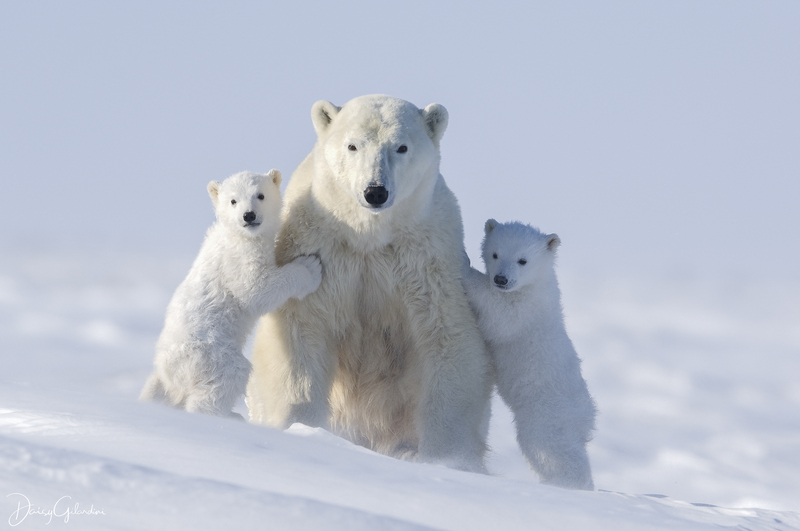 In early spring (February to March), female polar bears, which entered maternity dens in October and gave birth in November, are ready to emerge for the first time with their four-month-old cubs. The timing coincides with seals giving birth to their pups on the Hudson Bay pack ice, which means easy food for the bears. Conditions are extremely challenging at this time of year, with temperatures dropping to -54 degrees Celsius with the wind chill. I feel very privileged and grateful to be able to spend so much time with the most iconic animal of the Arctic kingdom. I feel that it is my duty as a conservation photographer to capture the beauty of species-at-risk and raise awareness of their challenges — to give a voice to these animals. While science provides the data necessary to explain issues and suggest solutions, photography symbolizes these issues and helps move people to action, for nature and for us. See more of Daisy's work at daisygilardini.com. Purchase your copy of Best Wildlife Photography 2018!